The site details the floor plans of a luxury condo and Town house development in the central West End. 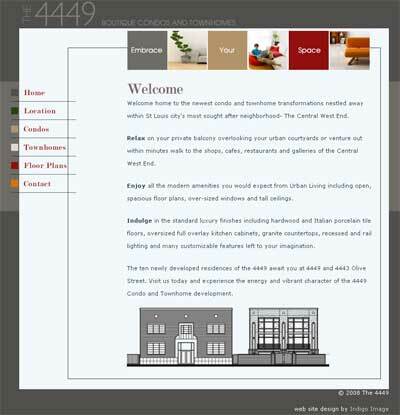 The web site is the latest brand element we have created for this project. Next come business stationery and a brochure. just thought you would like to know: the poster URL http://www.embrace4449.com/ has one extra "4" in it. Thanks asoon for pointing that out…all fixed now. For one terrible moment I thought you meant the building banners that have just been installed had, the typo…broke out in a cold sweat I tell you!